Experience top-notch Honolulu Airport Transportation service with our comfortable and classy Sedan cars. Book now as Royal Hawaiian Limousine offers the best value for your money when it comes to VIP airport transfers in Oahu. Our Sedan car services comes with a professional chauffeur that will drive you safely to, and or from the Honolulu International Airport to your hotel or to any desired destination. For our Sedan transfer service from the airport, we offer VIP one-way and roundtrip transfers. Royal Hawaiian Limousine also has sedan car transportation packages if you are staying in a hotel outside of Waikiki. We offer Honolulu Airport transfer from and/or to some of Hawaii’s famous hotels including Kahala Resort, Aulani Resort, Ko Olina Resort, Makaha Resort, and Turtle Bay Resort. Our clean and fully-insured sedans are guaranteed to provide you with a secure and first-class transportation. Our chauffeurs are courteous and friendly, and will provide you with a comfortable transportation as you watch the bustling and vibrant city of Honolulu from inside our Sedan. Make your Hawaiian vacation a trip to remember with our VIP Sedan airport transfer service, book now! Note: RHL’s standard sedan car transfer service covers a maximum of 3 passengers. You also have the option to add a fresh Hawaiian Lei in any of our sedan car services. 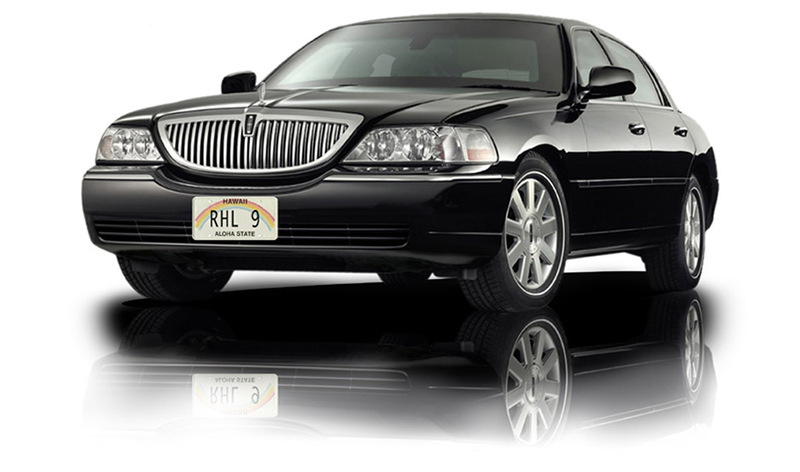 Check out Royal Hawaiian Limousine’s Sedan Car Service packages.